All New Invaders keeps chugging along at a consistently entertaining level. 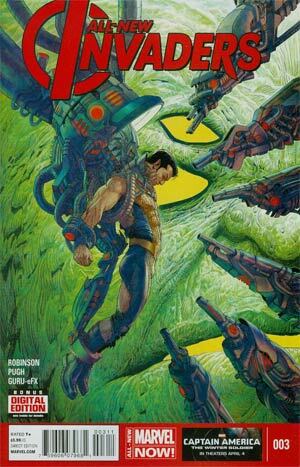 I’ve always found the Invaders to be an interesting team and they are getting the team back together in a very interesting story that through me for a bit of a loop with something unexpected. This week brought us another familiar face for Invaders fans back into the fold, along with a new development at the end that keeps that stakes high. Captain America and Torch make their way to Avengers mansion to regroup. They contact Thor to fill him in on the Gods’ Whisper device. According to Thor though, Balder warned the Asgardians about the device when he was originally captured when it was created. Odin had Freyja create an enchantment to protect the device from ever controlling them. The only reason Hela was able to be controlled previously is that she didn’t believe the device would work and refused protection, until after her capture and control. With this in mind, Captain America believes their mission has changed to just rescuing Namor, to which he already has Bucky working on. Bucky has been tasked with finding the original Vision from the Invaders, Aarkus. Aarkus has been in hiding since last popping up in X-Men Legacy with Legion. Bucky finds him in the form of a dog living with a homeless man. He is filled in on the situation and agrees to help. The four meet in the middle of the desert. For travel, Aarkus relies on smoke and to travel as far away as the Kree homeland, he will need a lot. Torch burns the quinjet he and Cap has used for travel. This creates the smoke they need and the four are transported away. They reach Hala hoping that they would arrive undetected. This is not the case and Tanalth is waiting for them with a squad of Kree soldiers. The heroes explain to her what Thor told them about the device now being useless. In response she tells them that the Asgardians are not the only gods, as Ikaris of the Eternals comes crashing to fight, under Kree control. First off, I was very happy to see another original Invader join the group. Having Aarkus on the team gives it some more depth beyond the main three and Namor, who they are rescuing. Then half way through the issue they announce that the device won’t work on Asgardians. I was set to believe that the Kree just didn’t think through on their plan, and then we have Ikaris show up. To be honest, I’m not a fan of the Eternals, but having them in here really shakes things up and brings a new twist that I was not prepared for. I’m still really enjoying Pugh’s art on the book. You get some really gorgeous pages; Namor being dehydrated, Ikaris crashing through rock in his reveal. The sequence with Bucky and Aarkus traveling through the smoke to meet with Steve and Jim was excellent as well watching the trail as they moved through it and the hundreds of doors all around them, all ajar. Robinson and Pugh are quickly weaving one of my favorite Invaders tales in years. Robinson is bringing some top notch dialogue to the table with some really interesting twists and additions along the way. Pugh backing him up with great pencils is just sealing the deal. I’m excited to see what they bring to our heroes next, which also means I’m excited to see what is occurring with the Eternals for the first time ever. In one big regard, it’s strange that this book has continued on for as long as it has with Damian having been dead as long as he has. If you are actually picking up this book though, its not hard to understand why its still with us. I have to admit, the last arc with Two Face was my least favorite of this series. It was just weaker than what has come before. In this issue though things get back on the right footing and puts a focus back on the recently deceased son and sidekick. Ra’s Al Ghul has stolen Damian and Talia’s bodies from Wayne Manor and Batman wants them back. This brings him near the island that Damian was trained on. Searching through the ocean of course brings him to a welcome friend, Aquaman. Batman fills Aquaman on why he is there and in turn Aquaman tells him he is there because he heard the screams of whales coming from near the island. Sure enough Ra’s is on the island with the bodies. He sends assassins to deal with them while he prepares to leave with the remains, in fear two members of the Justice League together could bring more of their teammates. He sets the complex to explode and for the hard drives to erase. 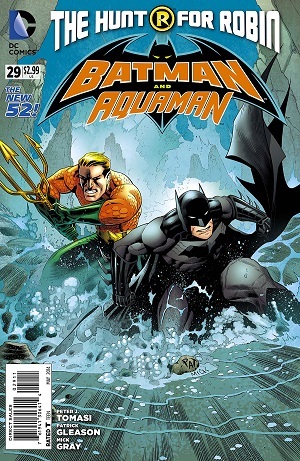 Meanwhile Batman and Aquaman fight through the assassins and make it to land. They find the cause of the whales’ screams to be that Ra’s has continued Talia’s experiments of making super-humans inside the wombs of sperm whales. Whatever was grown inside burst through the sperm whales killing them. Batman makes his way into the complex to find what Ra’s created, horribly mutated and deformed version of Damian. He starts fighting them, but tries to not harm them to much. Aquaman joins the fight inside and since the mutated Damian clones where birthed in a whale’s womb, he is able to control them as they are in at least part aquatic. This gives Batman the chance to make his way to Ra’s jet. He tries to breakthrough the cockpit as it takes off, but is eventually flung off. Before he falls though he overhears Ra’s mention his next stop, Paradise Island. He parts with Aquaman and finds Wonder Woman in England where he tells her he needs her to take him to Paradise Island. The Hunt For Robin has the possibility to be a very interesting story and it has come out of the gate with an excellent issue. The issue is very action heavy and Gleason handles it perfectly. His drawings of the deformed Damian’s are truly grotesque and almost horrifying, especially when Batman has to find these warped clones of his son. This doesn’t even include the dead sperm whales on the beach ripped open from the inside. If Gleason wanted to draw a straight out horror book, I can easily say he could do it easily after this issue. Will Ra’s be able to resurrect Damian where Bruce failed? It’s early to say, but you never know, it could happen. Until we see that answer to its end though, it appears that we’re going to get a mix of the Justice League with Batman as he goes on this journey which will be interesting to see. This has been a very emotional and obviously personal journey for Batman, and I’m glad we have Tomasi and Gleason steering us through this dark journey.